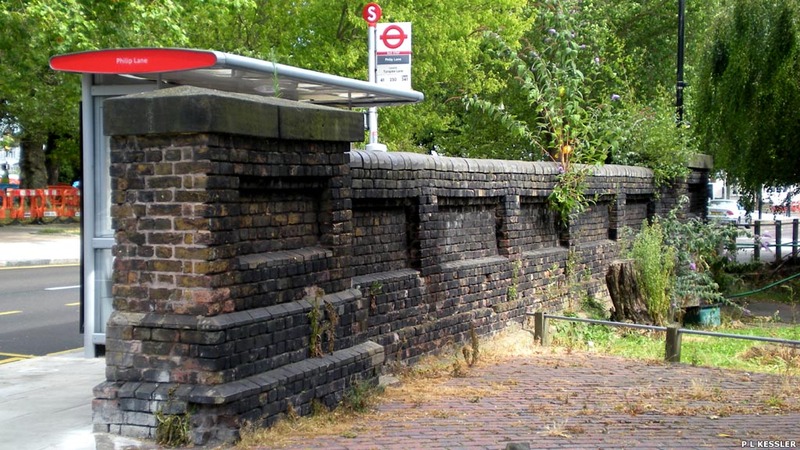 The North London branch line between Seven Sisters and the former Palace Gates Station was opened by the Great Eastern Railway in 1878, as a westwards extension of their 1872 Lower Edmonton services. The branch had originally been intended to reach Alexandra Palace itself, but the plans were cut back due to the high incline up to the palace. Trains travelled regularly from Palace Gates and North Woolwich for much of the line's lifetime, but passenger services ended in 1963, and the line closed in 1964. The route now offers a particularly complex railway walk of approximately four kilometres (two and-a-half-miles) as so much of the trackbed has been lost to later development. Some particularly interesting amateur film footage from the late 1950s is available to view on YouTube, covering the entire rush hour route from North Woolwich to Palace Gates. Six photos on this page contributed by Alan Swain, eighteen by Philip Lindhurst, two by Pendar Sillwood, two by Nick Catford, and one by Mark Bracegirdle, reproduced with permission, with additional information by Barry Ritter and Mark Bracegirdle.